The Alan Cornish Theatre is located in the Oakwood Centre on Headley Road. 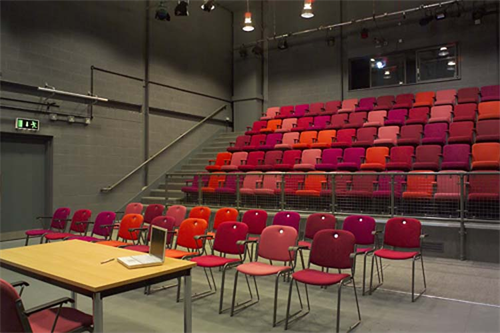 The theatre seats 100 people and can be hired for plays, dance performances, training and meetings. For information or bookings contact bookings@woodley.gov.uk. The theatre is the home of Woodley Theatre (formerly “Woodley Players”), which was established in 1945. It is a thriving amateur group with a reputation for mounting productions of a very high standard. They typically put on six productions a year, including a Christmas show and a production from the youth group. For more information on forthcoming productions, joining the group, and tickets go to www.woodleytheatre.org. By becoming a season ticket holder you save 20% of the ticket price, and members can select their own seats for all the plays. Full details can be obtained from the box office on 07939 210121.